Retinopathy of prematurity (ROP) is a vasoproliferative disease that affects premature infants. The reported incidence of ROP in the Western world ranges from 21% to 65.8%, whereas in India, recent studies shown that the incidence of ROP varies from 38% to 51.9% among low birth weight babies. ROP is on a rise in India as a result of the improved neonatal care and better neonatal survival rate. Approximately 2 million babies out of 26 million annual live births in India are born with birth weight <2000 g and are at risk of developing ROP. The World Health Organization's “Vision 2020 programme” has identified ROP as an important cause of blindness in both high- and middle-income countries. In the United States, the ROP remains the second most common cause of childhood blindness. WHO estimates that there are 15 million preterm births a year (born at <37 weeks) and India has the largest number of preterm births in the world. There are 2 theories that explain the pathogenesis of ROP development –a classic theory by Ashton and Patz and a gap junction theory by Kretzer and Hittner. The “classical” theory proposed by Patz and Ashton describes an initial hyperoxic phase of the disease that results in arteriolar constriction with subsequent irreversible vaso-obliteration. A second phase follows consisting of a vasoproliferative response induced by retinal ischemia as a result of retinal capillary closure. The pathogenesis described by the “gap junction theory” of Kretzer and Hittner is based on the activity of mesenchymal spindle cell precursors of retinal capillaries. These mesenchymal cells migrate centrifugally from the optic disc toward the junction between vascular and nonvascularized retina and form a new capillary network. Under hyperoxic conditions, abnormal gap junctions appear between adjacent spindle cells, and this interferes with normal cellular migration and vascular formation. The angiogenic factors secreted by these mesenchymal cells may in turn trigger a neovascular response. During intrauterine life, the fetal retina is in a hypoxic state. Regardless of gestational age at delivery, ROP begins to develop between 32 and 34 weeks after conception and has two phases. During the initial acute phase, the normal vasculogenesis of the retina is disturbed by the relative hyperoxia of the extrauterine environment and is further worsened if the baby requires oxygenation postdelivery. This results in obliteration of vessels and nonvascularization of areas of the anterior retina. A second chronic phase follows due to the subsequent hypoxia, which in turn stimulates vascular endothelial growth factor (VEGF) in some cases leading to arteriovenous shunts and neovascularization, occasionally leading to visual impairment. Although many causative factors have been proposed for ROP, only low birth weight, low gestational age, and supplemental oxygen therapy following birth have been consistently associated with the disease. American academy of pediatrics recommends screening for infants with a birth weight of ≤1500 g or gestational age of 30 weeks or less and selected infants with a birth weight between 1500 and 2000 g or gestational age of >30 weeks with an unstable clinical course, including those requiring cardiorespiratory support. The criteria for initiating and stopping ROP screening have been provided from the two large clinical trials – the multicenter trial of cryotherapy (CRYO-ROP) study and the light reduction in ROP (LIGHT-ROP) study. Timing of the initial examination for at-risk infants is based on both postmenstrual age and chronological age. Initial screening for ROP should be performed at 31 weeks' postmenstrual age in infants with gestational age <27 weeks at birth, and at 4 weeks' chronological age in infants with gestational ages of 27 weeks or more at birth (American Academy of Ophthalmology recommendation). Stage 3 ROP: Zone II. Unequivocally regressing ROP: Zone II. 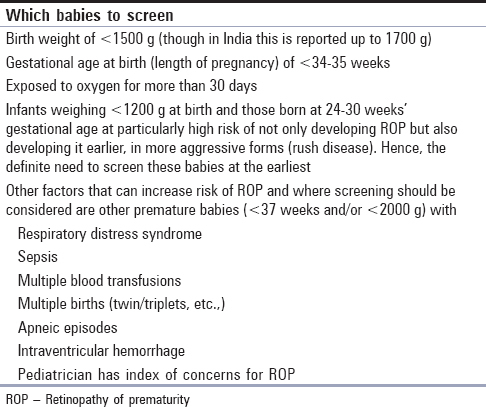 Other factors that have been suggested as contributing factor for ROP [Table 1] include bronchopulmonary dysplasia, number of blood transfusions, parenteral nutrition, hypocarbia/hypercarbia, early intubation, hypotension, patent ductus arteriosus, necrotizing enterocolitis, administration of β blockers to mothers before delivery, intraventricular hemorrhage, poor postnatal weight gain, and Candida sepsis. Traditionally, screening for ROP is done by a trained ophthalmologist/retina specialist with an indirect ophthalmoscope and 28 D lens. The babies eyes are dilated with diluted tropicamide plus and swaddled, and the eyes are anesthetized with proparacaine eyedrops. Preferably, the screening should be done in the Neonatal Intensive Care Unit (NICU) itself under monitoring. However, the Retcam has revolutionized the technique for screening of ROP. It is digital imaging equipment for examining the pediatric fundus. It is a nonstressful way to screen premature babies and is easier to perform when compared to indirect ophthalmoscopy performed by ophthalmologists, which requires added skill and experience. Trained nurses or technicians can easily perform examination with Retcam. It is easily mobile and helps to access remote areas where sufficient facilities are unavailable. It offers better cardiorespiratory stability during examination in children. It also helps to keep a photographic record of the screened patients. The Karnataka Internet-Assisted Diagnosis of ROP (KIDROP) is a Narayana Nethralaya Postgraduate Institute's initiative. This flagship Tele-Ophthalmology Program was started in 2008 aimed to provide ROP screening for rural and semiurban infants. KIDROP has trained technicians to screen infants in the peripheral centres using the Retcam and store, read, analyze, grade, and upload these images from the rural centre itself using an indigenously developed internet-based picture archival and communication system to trained ophthalmologists. In 1984, International Classification of ROP (ICROP) was published which standardized the terminology used to describe ROP. Later in 2005, a second committee for the classification of ROP revised the original ICROP. The normal blood vessels of the retina progress from the optic nerve posteriorly to the edge of the retina (ora serrata) anteriorly. The location of ROP is a measure of the extend of normal progression of blood vessel development that has reached before the disease takes over and severity is categorized by severity of disease in different zones. Three circular zones are defined with the optic disc at the center [Figure 1]. Zone I is a small area around the optic nerve and macula. The radius of Zone I is equal to twice the distance between the disc and the fovea. Disease involving Zone I is the most dangerous. 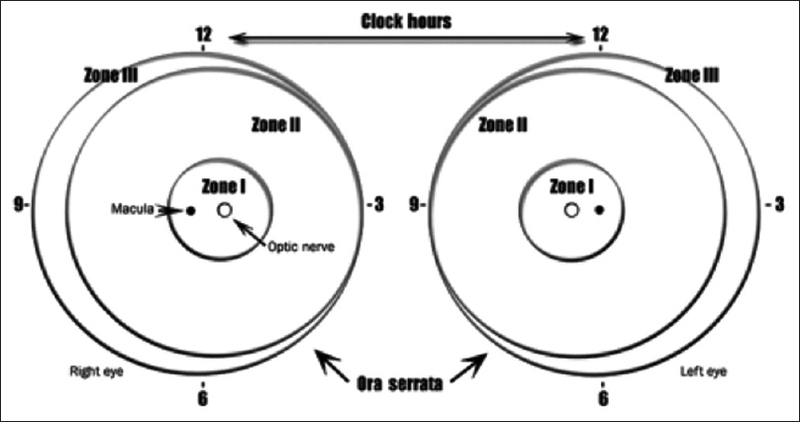 Zone II is the area of retina up to the equator on the temporal side and up to the ora serrata on the nasal side. Zone III is the crescent of retina extending from the equator to the ora on the temporal side. The retina is segmented into twelve sectors similar to a clock. The number of clock hours of the eye's circumference involved is defined as extend of the disease [Figure 1]. ROP is a progressive disease that may progress slowly or rapidly. It consists of 5 stages. Stage 1 ROP is characterized by a white line separating the clearly normal vascularized retina from the sharply contrasting avascular white/gray retina. Stage 2 ROP displays a rolled thick ridge of scar tissue instead of only a line that separates vascular and avascular retina. It may be limited to a small area or may encircle the entire retina. Stage 3 ROP is characterized extraretinal fibrovascular proliferation. There is the development of abnormal new blood vessels and fibrous, scar tissue, arrowhead on the edge of the ridge seen in Stage 2. These vessels are lifted off from the surface and may project anteriorly into the vitreous. Stage 4 ROP constitutes subtotal/partial retinal detachment beginning at the ridge. It occurs due to anterior pulling of the retina by the scar tissue into the vitreous. Depending on the extent of involvement, Stage 4 is further divided into Stage 4A (sparing macula) and 4B (involving macula). Stage 5 ROP involves complete retinal detachment. Any stage or zone of ROP may be associated with the presence of plus disease, which is an ominous sign. Plus disease is characterized by arteriolar tortuosity and venous engorgement of the posterior pole, iris vascular engorgement, pupillary rigidity, and vitreous haze. This is defined as the presence of less than threshold disease in Zone 1, or Stage 2 plus disease in Zone 2, or Stage 3 without plus disease in Zone 2, or Stage 3 plus disease with extent less than that for threshold disease. Threshold ROP – this is defined as Zone 1 or Zone 2 with Stage 3+ ROP extending for 5 contiguous sectors or 8 composite sectors (30° sectors). This is a rare, rapidly progressing, severe form of ROP. It usually progresses to Stage 5 ROP if left untreated. The characteristic features of this type of ROP are its posterior location, prominence of plus disease, and the ill-defined nature of the retinopathy. This has been referred previously as rush disease. Various trials have been conducted to find an effective treatment for ROP. Cryotherapy was an initial treatment modality tried for ROP. The trial (CRYO-ROP) conducted came out with promising results. Eyes with threshold ROP was selected for trial and results showed 40%–50% reduction in poor structural outcome in eyes that underwent cryotherapy compared to control eyes. With the advent of newer treatment modalities, cryotherapy is less frequently used at present. A randomized controlled trial was conducted by supplementing therapeutic oxygen for prethresold ROP (STOP ROP). The result showed that supplemental oxygen did not cause additional progression of ROP although it did not significantly reduce the number of infants requiring peripheral ablative surgery. Another multicenter clinical trial (LIGHT-ROP) designed to determine if a reduction in ambient light exposure to premature infants eye would reduce the incidence of ROP. The results showed no relation between light reduction and incidence of ROP. The early treatment for ROP randomized trial (ETROP) came out with promising results and put forward revised indications for the treatment. The ETROP study recommends retinal ablative therapy for eyes with Type 1 ROP, defined as Zone I, any stage ROP with plus disease; Zone I, Stage 3 ROP without plus disease; or Zone II, Stage 2 or 3 ROP with plus disease. The study also recommends a wait-and-watch approach to type 2 ROP, defined as Zone I, Stage 1 or 2 ROP without plus disease or Zone II, Stage 3 ROP without plus disease. The eyes with Type 2 ROP should be considered for treatment only if they progress to Type 1 or threshold ROP. Laser photocoagulation of the entire avascular retina with confluent grey white burns is now the treatment of choice for Type 1 ROP. The laser is delivered with the laser indirect ophthalmoscope and both the diode or the double frequency Nd YAG laser can be used. The treatment can be given as a single setting and both eyes treated at the same sitting. The treatment is given preferably in the NICU with constant monitoring. Humanized anti-VEGF monoclonal antibody has evolved as an effective treatment for many vasoproliferative retinal diseases. The study to assess the efficacy of intravitreal bevacizumab for Stage 3+ ROP (BEAT-ROP) reported a significantly lower rate of recurrence with Zone I disease when treated with intravitreal bevacizumab (42% vs. 6%, P = 0.003) compared to conventional laser therapy. The authors conclude that intravitreal bevacizumab has increased efficacy over conventional laser therapy for Stage 3+ ROP within Zone I. Conventional laser therapy causes destruction of the peripheral retina and permanent visual field defects whereas intravitreal bevacizumab does not hinder the continued vascularization of the peripheral retina. Anti-VEGF therapy plays a role in primary therapy for aggressive posterior Zone 1 disease (Aggressive posterior ROP). Anti-VEGF therapy also helps to reduce media haze in media haze due to aggressive posterior disease to improve visualization for laser treatment. Failed laser treatment leading to persistent neovascularization, tractional elements, or tractional retinal detachment before surgery are other indications for anti-VEGF therapy. Pan-VEGF blockade for the treatment of ROP (BLOCK-ROP) study is another ongoing study assessing the efficacy of role for bevacizumab. Surgery is indicated for tractional retinal detachment seen in Stage 4 and Stage 5 disease. The aim for surgery in Stage 4 disease is to prevent and limit the progression of peripheral tractional detachment from involving the posterior pole. The initial results of surgery in ROP were disappointing. The surgery on eyes with Stage 4 retinal detachment in the ETROP showed 67% reattachment with scleral buckle and only 33% reattachment with vitrectomy. The modern vitreoretinal surgical tools and more knowledge about the progress and outcome have improved the surgical outcome in ROP. A study conducted by Sear et al. has reported reattachment in 86% of eyes following surgery. In Stage 5, ROP results of surgical interventions are still poor. Common sequelae in ROP babies in addition to retinal detachment include macular heterotopia, high myopia, amblyopia, strabismus, anisometropia, glaucoma, and phthisis bulbi. The contraction of fibrovascular tissue that drags the macula temporally results in macular heterotropia. It usually results in poor central vision unless it is very mild. Myopia is strongly associated with ROP severity. Sixty-five percent developed myopia by 9 months of age, and 26% had myopia of 5 D or greater among those eyes treat at high-risk prethresold in ETROP study. In addition, amblyopia, strabismus, and nystagmus are more common in preterm infants who develop ROP. Propranolol has been used for the treatment of infantile hemangiomas, and there are a few reports describing the effect of this β-adrenergic receptor blocker in the regulation of retinal angiogenesis. In a mouse model of oxygen-induced retinopathy, systemic administration of propranolol has shown to reduce the expression of retinal VEGF and insulin-like growth factor-I (IGF-1), thus reducing retinal neovascularization and vascular leakage. A pilot study, the Safety and Efficacy of Propranolol in Newborns with ROP (PROP-ROP), was planned to compare safety and efficacy of propranolol with conventional laser treatment alone for Stage 2 ROP in Zone II or III without plus disease in premature infants. However, the increased mortality in the treatment arm made the researchers to halt the study. Gene therapy aims at targeting and regulating various cytokines and growth factors known to be involved in the pathogenesis of ROP. In a publication by Chowers et al., they demonstrated that the intravitreal gene transfer was possible in a rat model of ROP. Local gene transfer was carried out by the intraocular delivery of recombinant viruses carrying genes encoding angiostatic proteins and small interfering RNA against various cytokines and their receptors located in the retina which promotes vascular proliferation. Although gene therapy has shown positive results in animal studies, the safety and other possible effects to a preterm infant are still unsure. In a ROP mouse study, it was found that an increased retinal omega-3 and omega-6 polyunsaturated fatty acid ratio had 50% protective effect against pathologic neovascularization due to increased regrowth of vessels after vessel loss. In preterm infants, low levels of IGF-1 have been associated with impaired growth and development of ROP. Smith et al. reported a suppression of retinal neovascularization by an IGF-1 receptor antagonist. IGF-1 treatment may help normal retinal vascular development and prevent abnormal vascular proliferation, although there is no existing study among premature infants. Granulocyte colony-stimulating factor (GCSF), a biologic cytokine which increase leukocyte counts, has been shown to increase levels of IGF-1 as well. IGF-1 supports the normal vasculogenesis, so GCSF may promote angiogenesis in ischemic retina without any known negative effect on VEGF, although there are no evidence available on its safety and its effectiveness. The antioxidant system is functionally immature in premature infants and premature infants are susceptible to oxidative stress. Vitamin E, an antioxidant, has been hypothesized to have a protective role in preventing ROP. Vitamin E administration could increase the risk of developing sepsis and necrotizing enterocolitis in premature infants, so its use is currently not recommended. The incidence of ROP has increased over the years and is probably related with the advances in NICU by improving the survival rates of the very premature infants who previously did not survive. This warrants a close screening and treatment for premature babies who are at risk. The important preventive measure for the avoidance of ROP-related blindness includes better oxygen control and improvements in nutrition. ROP screening for at risk premature infants performed by an experienced ophthalmologist remains the most important strategy in the management of ROP. In developing countries, the introduction of Retcam-assisted screening enables screening and follow-up of the rural population where an experienced ophthalmologist may not be available. Currently, panretinal laser photocoagulation has replaced cryotherapy as the gold standard treatment for ROP depending on the severity of disease. Among the various ongoing treatment approaches currently under trial to suppress the neovascularization, anti-VEGF drugs provide valuable and encouraging information, especially in Zone 1 disease. Although many ongoing animal trials aimed at finding an ideal treatment has come out with newer treatment options, their safety and effectiveness among humans are yet to be established. Jalali S, Anand R, Kumar H, Dogra MR, Azad R, Gopal L, et al. Programme planning and screening strategy in retinopathy of prematurity. Indian J Ophthalmol 2003;51:89-99. Pejawar R, Vinekar A, Bilagi A. National Neonatology Foundation's Evidence-Based Clinical Practise Guidelines (2010), Retinopathy of Prematurity. New Delhi: NNF India; 2010. p. 253-62. Howson CP, Kinney MV, Lawn JE, editors. March of Dimes, PMNCH, Save the Children, WHO. Born Too Soon: The Global Action Report on Preterm Birth. Geneva: World Health Organization; 2012. Terry TL. Extreme prematurity and fibroblastic overgrowth of persistent vascular sheath behind each crystalline lens I. Preliminary report. Am J Ophthalmol 1942;25:203-4. Heath P. Pathology of the retinopathy of prematurity: Retrolental fibroplasia. Am J Ophthalmol 1951;34:1249-59. Wheatley CM, Dickinson JL, Mackey DA, Craig JE, Sale MM. Retinopathy of prematurity: Recent advances in our understanding. Br J Ophthalmol 2002;86:696-700. Fierson WM, American Academy of Pediatrics Section on Ophthalmology, American Academy of Ophthalmology, American Association for Pediatric Ophthalmology and Strabismus, American Association of Certified Orthoptists. Screening examination of premature infants for retinopathy of prematurity. Pediatrics 2013;131:189-95. Parveen S, Chetan R, Nishant B. Retinopathy of Prematurity: An Update, Sci J Med & Vis Res Foun 2015;XXXIII:93-96. Jorge EC, Jorge EN, El Dib RP. Early light reduction for preventing retinopathy of prematurity in very low birth weight infants. Cochrane Database Syst Rev 2013;8:CD000122. doi: 10.1002/14651858.CD000122.pub2. Good WV, Early Treatment for Retinopathy of Prematurity Cooperative Group. Final results of the early treatment for retinopathy of prematurity (ETROP) randomized trial. Trans Am Ophthalmol Soc 2004;102:233-48. Helen A, Mintz-Hittner, Kathleen A. Kennedy, Alice Z. Chuang. Efficacy of Intravitreal Bevacizumab for Stage 3+ Retinopathy of Prematurity.N Engl J Med. 2011; 364: 603-15. doi: 10.1056/NEJMoa1007374. Repka MX, Tung B, Good WV, Shapiro M, Capone A Jr., Baker JD, et al. Outcome of eyes developing retinal detachment during the early treatment for retinopathy of prematurity study (ETROP). Arch Ophthalmol 2006;124:24-30. Sears JE, Sonnie C. Anatomic success of lens-sparing vitrectomy with and without scleral buckle for stage 4 retinopathy of prematurity. Am J Ophthalmol 2007;143:810-3. Filippi L, Cavallaro G, Fiorini P, Daniotti M, Benedetti V, Cristofori G, et al. Study protocol: Safety and efficacy of propranolol in newborns with retinopathy of prematurity (PROP-ROP): ISRCTN18523491. BMC Pediatr 2010;10:83. Chowers I, Banin E, Hemo Y, Porat R, Falk H, Keshet E, et al. Gene transfer by viral vectors into blood vessels in a rat model of retinopathy of prematurity. Br J Ophthalmol 2001;85:991-5. Hunt S. Increased dietary intake of omega-3-PUFA reduces pathological retinal angiogenesis. Ophthalmologe 2007;104:727-9. Smith LE, Shen W, Perruzzi C, Soker S, Kinose F, Xu X, et al. Regulation of vascular endothelial growth factor-dependent retinal neovascularization by insulin-like growth factor-1 receptor. Nat Med 1999;5:1390-5. Capoluongo E, Vento G, Ameglio F, Lulli P, Matassa PG, Carrozza C, et al. Increased levels of IGF-1 and beta2-microglobulin in epithelial lining fluid of preterm newborns developing chronic lung disease. Effects of rhG-CSF. Int J Immunopathol Pharmacol 2006;19:57-66. Saugstad OD. Oxidative stress in the newborn – A 30-year perspective. Biol Neonate 2005;88:228-36. Johnson L, Quinn GE, Abbasi S, Otis C, Goldstein D, Sacks L, et al. Effect of sustained pharmacologic Vitamin E levels on incidence and severity of retinopathy of prematurity: A controlled clinical trial. J Pediatr 1989;114:827-38.